These kettlebells are ideal for explosive exercises that work major muscles, build power, and burn body fat. This package includes 4 kettlebells of different sizes to get a great workout as many exercises only require just one, or a pair. With these kettlebells you can perform such exercises as the basic swing upwards through your legs, figure 8 swing around your legs, clean, clean & press, and more! 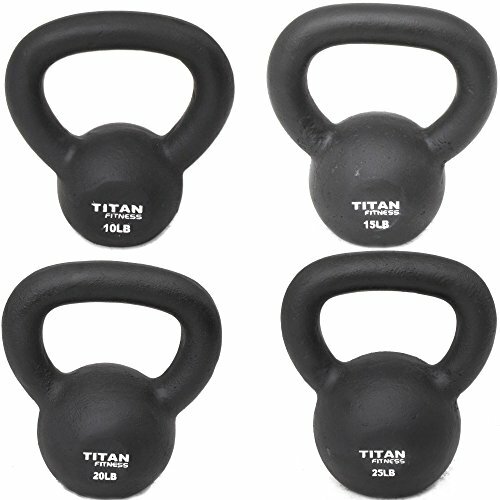 The Kettlebells from Titan Fitness are gravity cast in a single piece leaving no weak spots or welds. Extra wide handle for easy grip - Handle Width: 1.5"